65 AB763 BF410 Combo AKA The Marsh American!! The Amp made famous by bluesman and rocker worldwide. Awesome sounding classic tone with full spring reverb and the meaty punch four 10" Speakers can provide. A favorite amoung classic Rock, Blues and Country players worldwide!!! Two channels, one with Reverb and Vibrato (tremolo). 40 Watts of output into 4 Jensen C10Q's (several upgrade options available). Vintage Style 2-button footswitch!!! See more Pix in our Gallery section!!! This model will soon be sold as the Marsh American Amp!!!! 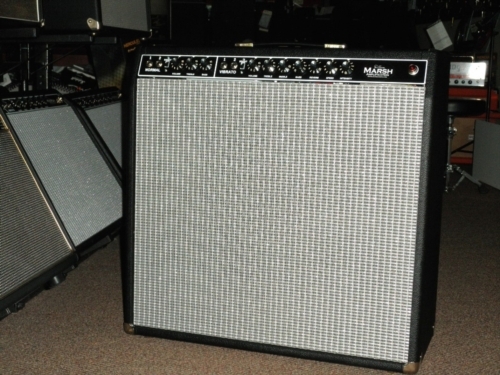 Like all Marsh Amp Replicas, these are made to order and have a 6 week lead time. The Overlord Mod can be added to all of our two channel blackface models. We add a tube socket and replace the normal channel with our D-style overdrive circuit. This mod comes complete with preamp boost, bright, rock/jazz stitches and ratio and level pots (rear mounted). With this mod both the stock blackface channel and overdrive channels can use the Reverb and Tremolo effects!!! The Buffalo Mod can be added to all of our two channel blackface models. We replace the normal a channel with a 50's era tweed circuit with a Volume, Tone and Master which allows you to dial in tweed mid rich blues edge or full on deluxe like crunch.